Much like cars and trucks, pontoons are susceptible to a variety of problems. And most of the serious issues you’ll encounter during your life as a pontooner are engine-related, as there are few other things that could affect the boat’s well-being quite as much. Today, we’re taking a look at the most common of these issues – how to spot them, recognize them, and what can you do to save your pontoon. The reason why we’re putting this one first is that an overheating engine can be ignorable at first, but will lead to the complete breaking of the engine if not taking care of. And you don’t want to realize you’re left with a dead engine with a whole party on your ‘toon 100 yards away from the dock. Make sure you’re always keeping an eye on the engine temperature gauge. If you notice any suspicious activity, check for blockages near the engine, or replenish the water in the cooling loop. If your pontoon is making weird screeching or whining noises when you’re trying to start the engine, it might be due to a couple of issues. The first probably the most common one is contaminated fuel, which happens when gas mixes together with water. This can occur right after you fill up your tank, and the best way to protect your engine, in this case, is to wait for the fuel and water to separate. Alternatively, you might want to install a fuel-water separator between the tank and the engine to prevent this from happening. Probably the most frustrating issue of all, a non-starting engine can happen due to battery failures, corrosion, or lack of fuel. If the third one is not the case, you might want to check the battery first and recharge or replace it as needed. Other electrical components might be the issue as well, so check the ignition circuit for any loose connections as well. Another common problem that leads to the engine to starting are oil gasket leaks – and if that’s the case, you need to replace your oil gasket as soon as possible. This is the one common issue that usually doesn’t have much to do with the engine. 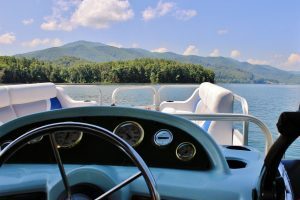 However, if your pontoon is not as sensitive to your steering commands as it used to be, you might want to check your steering ram and grease all the fittings and swivels. Using muscle power to steer an unlubricated system will only work for so long, and you don’t want to accidentally have to row back to the dock. While this might not seem like a huge issue at first, it’s very similar to engine overheating – it doesn’t really affect you too much until it actually breaks down on you. Last but not least, smoke emitting from the exhaust can cause even the most experienced boater to panic. However, that doesn’t always indicate engine failure – it might also be due to contaminated fuel, fuel injector failure, too low or too high oil levels, and more. If you see smoke coming out of the exhaust, we recommend you contact a mechanic as soon as possible. These are the top five most common problems pontooners come across when it comes to their boats. Some of these can be solved without the help of a professional, but if you’re one of the ‘better safe than sorry’ people out there, don’t hesitate to contact a mechanic if any of the above happens to your boat.